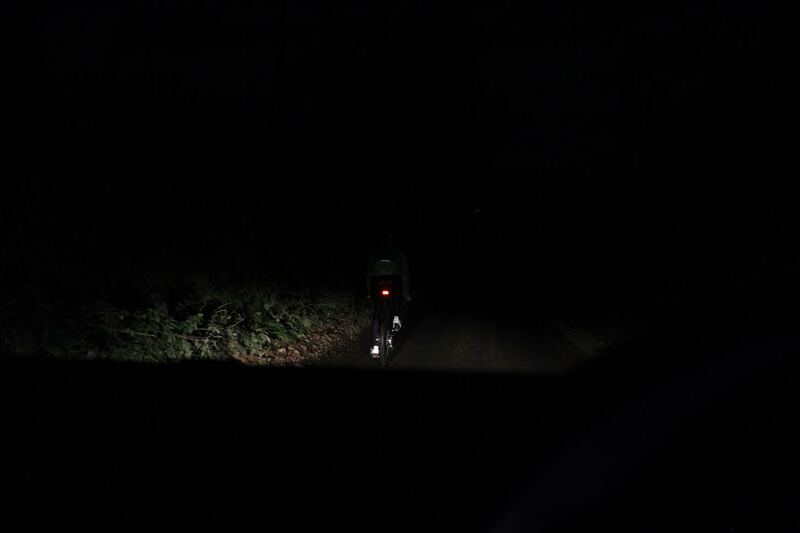 Cyclists, roadies, mountain bikers, tourers, bikepackers, commuters - you all know the situation - a car is approaching from behind, it's dark, they're going far too fast for your liking, and you're waiting for them to spot you before you're run off the road. 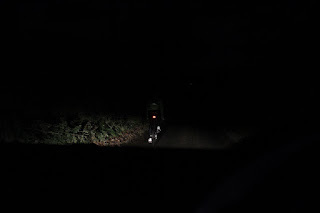 Cycling at night is something which has always worried me, even with front and rear lights I'm always fretting about how visible I am to other road users. After all, black Lycra isn't the most visible clothing. Of course you can get reflective bands to put on your legs, and your jersey or jacket may have reflective detailing but is it really enough? 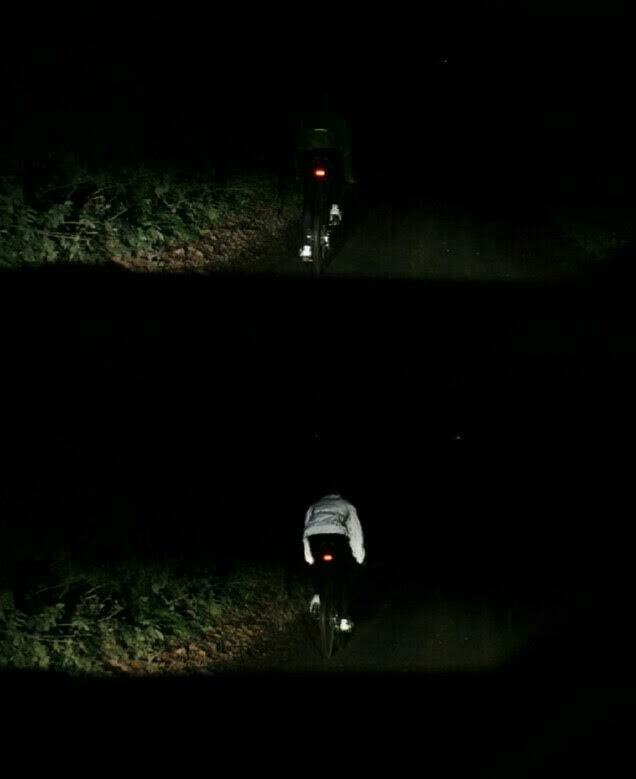 Luckily for those of us who like to cycle after dark, ProViz have come up with a jacket which certainly won't leave you wishing you were any more visible! 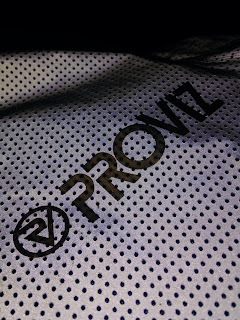 The ProViz REFLECT360+ is the British company's answer to the cycling reflective jacket. 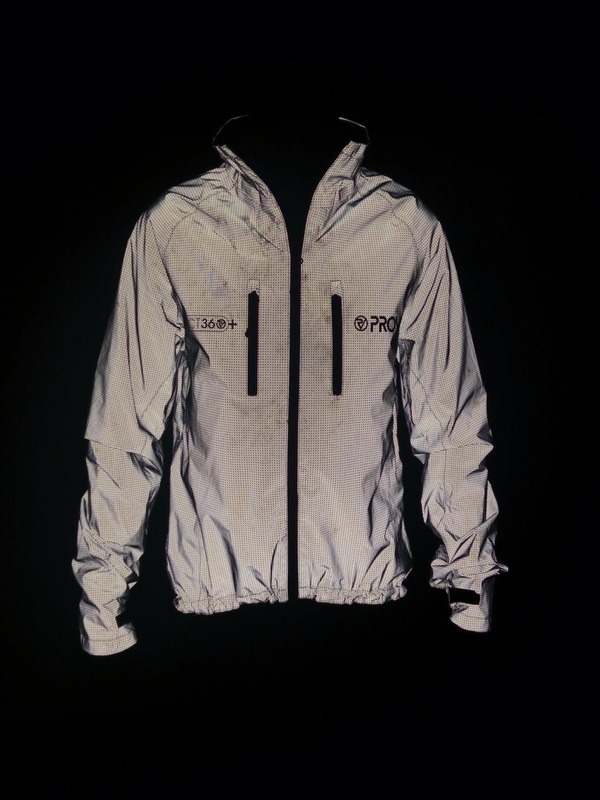 Unlike traditional jackets the REFLECT360+ is constructed entirely from reflective fabric, giving 360° visibility. Also available on Amazon.co.uk, Amazon Germany and Amazon Canada. Apologies for the dirt, blame the autumn roads! The jacket has the usual cycling specific features, the lower back pocket and slightly dropped rear hem. It also includes two chest pockets and an inside chest pocket, handy for storing a mobile phone (although unfortunately the inside pocket won't fit a 5.5" smartphone!). The two chest pockets have water resistant zips, and the rear pocket has an external storm flap to cover the zip. High quality zips and branded zipper pulls. As with the majority of cycling specific clothing the jacket lacks a hood, which I consider a good thing as I find hoods just get in the way on a bike. 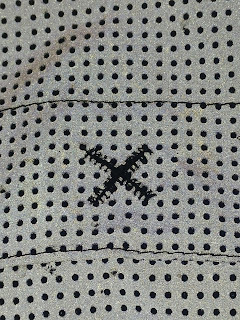 The body of the jacket is constructed from a TPU backed fabric covered in millions of tiny glass beads, giving the jacket it's impressive reflectivity. 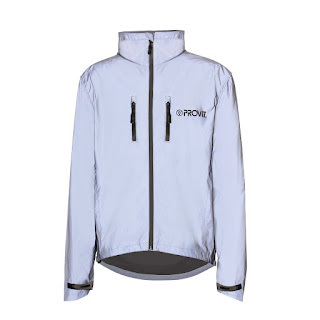 The material is fairly waterproof (with a hydrostatic head of 10,000mm, as compared to Gore-Tex Performance Shell at 28,000) and breathable (10,000gm/24hr, as compared to Performance Shell at 17,000). In daylight, the jacket is a dull grey color. Looking at the figures it's obvious that if you're looking for a jacket purely for keeping you dry it's worth looking elsewhere. However, with the well placed vents in reality the jacket is far more breathable than the numbers would suggest, and it is more than waterproof enough for the majority of rides. Saying this - it is still no match for any of the high end waterproof breathable fabrics. However, even with the breathability probably surpassing the numbers, the jacket can end up being a bit of a sweat trap - if you're working hard you'll just have to accept that waterproof fabrics won't keep you particularly dry! A nice touch is the microfleece lined collar, something which is definitely appreciated in the colder months! 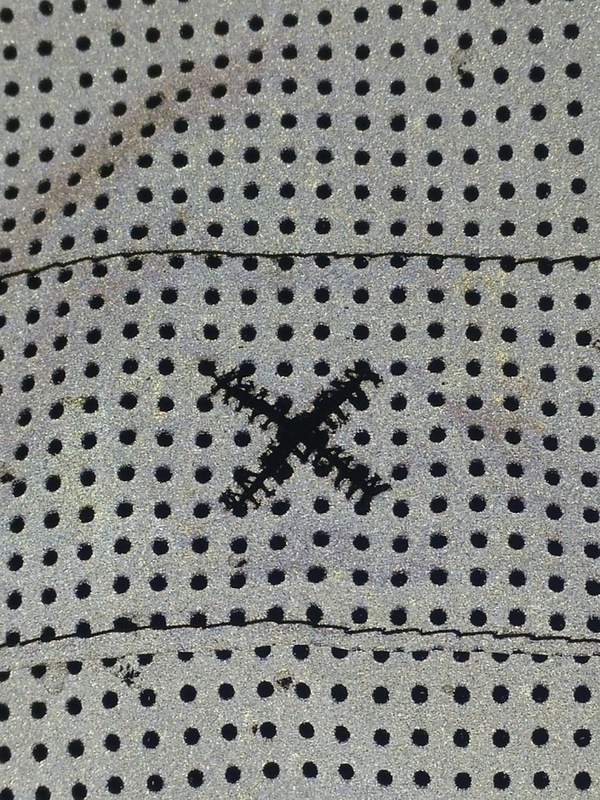 The stitching on the jacket is of a very high quality, too. 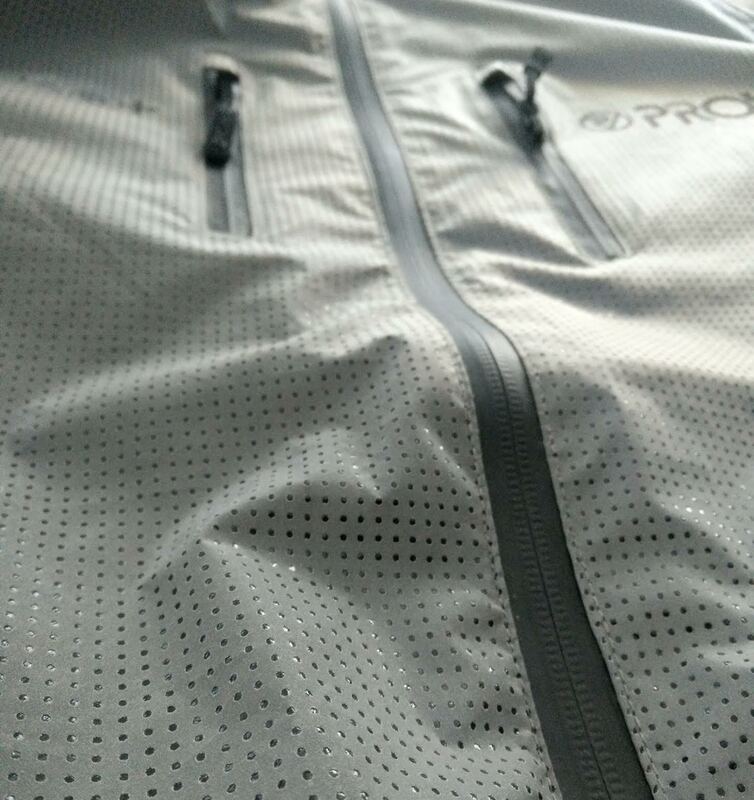 It's certainly noticeable that cars give me a much wider berth when I'm wearing the ProViz jacket as opposed to either a standard jersey or a jacket with only reflective detailing. It makes sense, drivers can see you from further away and so have more time to prepare to properly overtake, rather than trying to nip past at the last moment. difference between a fluorescent yellow rain shell and the REFLECT360+. One slight annoyance I noticed is that if you don't have the main zip all of the way up to the collar, the zipper pulls for the two pockets and the main zip all hang side by side at about the same level. Quite a few times I've gone to open a pocket and have ended up pulling the main zip open instead! 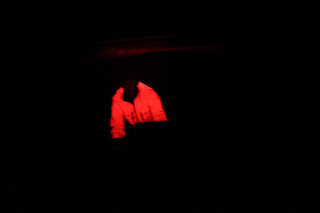 Whilst taking photos for the review, I noticed that when you are behind a braking car, the red light from the brake lights will light the jacket up bright red, pretty cool! This jacket runs large, I would wear a medium from most manufacturers but a small REFLECT360+ is as big as I'd be comfortable in. The sizing guide on the ProViz website is pretty reliable however, so make sure to check that before you buy anything! 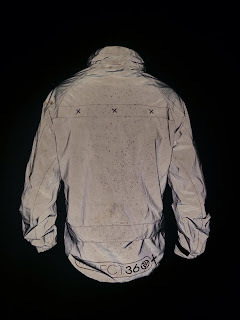 The main problem I've found is that if you size the jacket for a trim fit like most cycling jackets the back and shoulders will be restrictive if you're riding on the drops. This isn't a problem for people riding with flat bars, but for road bikes it feels like you're wearing a jacket a size too small. The jacket fits in most other respects - correct sleeve length, a slight rise on the front hem and a slightly dropped rear hem, it's just too restrictive over the back of the shoulders. Funnily enough, I find the jacket quite baggy around the midriff. It does have an adjustable waist which at least helps in this area but if you're a performance cyclist I can safely say the fit is not for you. This is a jacket suited mainly to more casual style cycling, it certainly wouldn't be described as a racing fit. It would be very well suited to commuting on a flat bar bike, although saying this - if you have slim shoulders or don't mind it being a little tight it's perfectly usable on a road bike. I find that once you're actually on the bike it's not an issue. This will obviously vary greatly as this is very subjective, although personally I really like the looks of the jacket. During the day it isn't obvious that it is a reflective jacket - it just has a dull grey colour. The jacket has branding on the chest and rear, and it looks great! 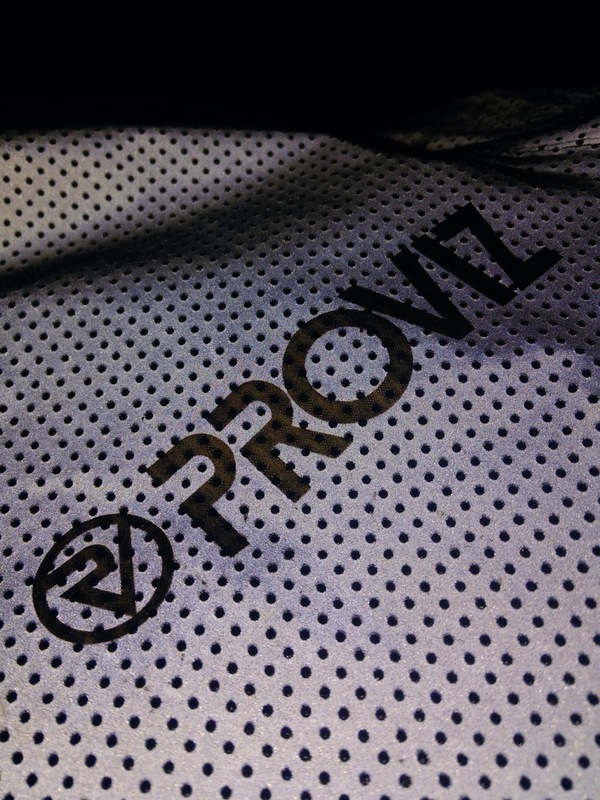 The ProViz logo and REFLECT360+ text are stylish and well designed. Makes you far more visible on the road than any standard clothing. 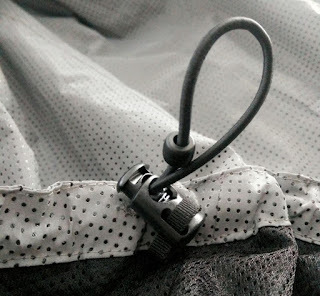 Cycling specific features like dropped rear hem, lower back pocket, and no hood. Understated looks during the day. Could do with being a little slimmer in the body and wider in the shoulders. 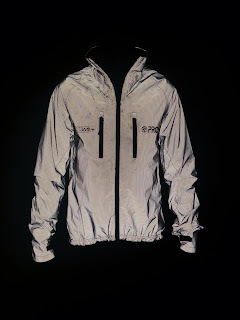 The REFLECT360+ Jacket retails for £109.99 at the time of writing and is available directly from the ProViz website. It's hard to comment on the price as there is nothing else on the market which gives anywhere near as much visibility whilst cycling, but on the whole it is expensive for a rain shell in this performance bracket. 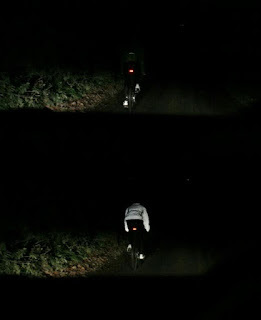 The REFLECT360+ is a solid performer, and certainly enhances your visibility to other road users. If you can get over the fit and breathability issues I'd definitely recommend it for commuting and winter riding, although if you cycle for speed I'd recommend you look elsewhere. In my opinion it's major selling point is that it can't be beaten in terms of reflectivity, and it certainly does a sterling job at this! Thanks to Anthony at ProViz for the opportunity to review a sweet jacket. Disclaimer: ProViz provided me with the product free of charge in exchange for this review. The opinions expressed above are my own and reflect my experience with the product. Review by Jake McConnell (part of HighballBlog.com outdoor athletes team who test and review outdoor gear).